2014 was a great year for gamers, and despite all of the game delays (which are making 2015 look even tastier), it was a year that saw innovation and big leaps in getting closer to the next-gen gaming we’re all waiting to see come to fruition. Unfortunately, the year also brought with it many games that had troubled launches and a lot of angry gamers that were upset about paying full price for broken games. But there were plenty of great games, too. In ranking my top 10 for this year, I had a few guidelines: While the remastered versions of Grand Theft Auto V, The Last of Us and Sleeping Dogs were all excellent iterations of those games (in order from first to last in terms of overall quality of remastering), two of them were originally released in 2013 and one in 2012 (Sleeping Dogs was also my 2012 game of the year) so I kept them in the honorable mentions list. I also tried to diversify my selections to make sure I was considering games on all three major platforms (PlayStation, Xbox [including their last-gen siblings] and Wii U) in order to end up with a list that represents the entire gaming industry for the year and not just one or two consoles. Also, please keep in mind I’m not much of a PC or handheld gamer, so there isn’t as much representation for those platforms here as you might expect from other people’s lists. So without further ado, I present to you my Top 10 games of 2014. Whether you agree with my list or not, please lets us know in the comments which games held your attention this year. I wasn’t one of the people who bought too much into the hype for this game, so when the alleged downgrade in graphics occurred, it didn’t affect me too much. I wasn’t even interested in this game until just before launch when one of the trailers finally caught my attention. By that time, the graphical changes had already taken place. I decided to give the game a fair try regardless of the controversy surrounding something that, to me, was just a matter of overhype and misunderstanding by most gamers. With that said, Watch Dogs was an excellent game. It didn’t have an epic storyline, and in fact, like a lot of Ubisoft games, the story was cliché and repetitive, but what it lacked in story it more than made up for in gameplay. The driving handled very well, the hacking mechanics were unique and well-implemented and the stealth action was a ton of fun. I even delved into the online a little bit, which isn’t something I normally do. Little Big Planet has always been a series that has a special place in my heart. I’ve played and own every version of the game and this game is no exception to the rule of high-quality construction these games have always been about. Though LBP 3 is more of the same, it manages to do something new by adding three new characters to the mix, all of which play well and fit in nicely to the LBP micro-verse. With the added bonus that levels, unlocks and DLC carry over from the previous games, even on next-gen systems, this is a game that will be in my PS4 for a very long time. Not only that, but the multiplayer (both online and local) are sure to keep me busy until the next game hits the market. Even though a lot of people may think the Disney Infinity games are too childish for adults to play, I’ve always held the belief that Disney appeals to all ages. Marvel, of course, spans the realm of child-to-adult too when it comes to appeal. So, DI 2.0 is a great combination. Add to that the fun that is collecting all of the figures and Power Discs and you’ve got a game that keeps you hooked all-year-long. Though this version is lacking in play sets (2.0 has three, all Marvel, compared to six Disney-themed play sets in 1.0), the improvements to Toy Box mode, character leveling, online iterations and the ability to use all of the figures from the first game add up to this game having a lot going for it. As long as you play it smart and get the game and figures for as cheap as possible, Disney Infinity is a blast. The Crew is another Ubisoft game with a cliché story and repetitive missions, but the publisher has also accomplished something unique here. From the developers behind the legendary Driver series, The Crew is a fast-paced racing adventure that spans the entire United States, albeit a highly-modified version of our nation. I haven’t had a lot of time to jump into The Crew, being that it released recently, but I did participate in all three beta sessions and the game has improved tremendously since the first one. It’s smooth, pretty and is full of badass cars to race across the country against players all over the world. What more could you want? I’ll admit when I first heard about Lego Batman 3, I was super excited. Out of all the Lego games I’ve played (and that includes most of them) Lego Batman is by far my favorite series in the franchise. However, when it was announced it would take place in outer space, I was a bit bummed. I thought it would feel too much like Lego Marvel, which isn’t a bad thing, but I had just beaten that amazing game and didn’t want too much repetition. Plus, I’m not a huge fan of aliens and outer space fantasy stories in general. Luckily, I was wrong. The game is fantastic and with an awesome cast of characters that includes Adam West, Conan O’Brien and Kevin Smith—not to mention classic Batman levels based on the 1960s TV show and The Dark Knight Trilogy among others—this game has plenty of content to keep me coming back for more Bat action at the same Bat time for quite a while. As a huge South Park fan, I eagerly anticipated this game through all of its delays and near-cancelations, through the demise of THQ and through its lengthy development process. It was well worth it. A game made for true fans, South Park: The Stick of Truth is one of the best games I’ve ever played. I ranked it a bit low on my list because it doesn’t have a great deal of replay value and it was a bit short. I also have never been into turn-based combat and almost didn’t buy the game because of this mechanic, but I took a chance and I’m glad I did. If you’re a South Park fan, this game comes highly recommended. If you’re not, it’s probably best to stay away seeing as a large portion of the fun is based on references to the TV show. Still, it’s a solid RPG and has a hilarious storyline. Forza Horizon was one of my favorite games on the Xbox 360 so when I heard a sequel was coming to Xbox One, I had to purchase an Xbox One. I had already owned a One and returned it because there weren’t enough games to play on it and because it didn’t feel worthy of the price tag, but this game, among a few others, got me to buy a new one. Once again, it was well-worth it. Forza Horizon 2 took everything that made the first game great and improved on it. The formula for this game works and I hope it’s a series that endures the test of time. Now, Smash Bros. is one of the only Nintendo series I never really got into. I’ve never been a fan of the gameplay style (the knocking your opponent off the side of the platforms, jumping around the fighting space, etc.) because I’m more into traditional fighters (like Tekken) and wrestling games. This game changed my opinion of the series though. The roster is amazing, the graphics and gameplay are stunning and the overall experience sucked me into the Smash culture. After playing a few multiplayer rounds with my little brother, who is a huge fan of the series, I’m hooked. I can’t say much about this year’s game in terms of comparing it to past entries, but I will say this: This game is excellent. It’s pure fun. Anyone who knows me knows that wrestling games are my favorite genre. I have tons of wrestling titles and buying the new release each year is like my Super Bowl. When I found out 2K was taking over the series from THQ I was pretty stoked because 2K’s sports titles, for the most part, are extremely high quality and do the sport justice to the fullest extent. When it comes to gameplay, this is one of the best entries in the series in years. The graphics are also amazing, aside from some ugly character models here and there. The improvements to commentary, lighting, the crowd, the sound effects and much more are extensive and well-done. But the lack of modes and match types is disappointing. The online is terrible, with no lobby, which makes it extremely difficult to get into a match, and when you do, the lag and move spamming makes it a horrible experience anyway. The biggest blunder is the terrible creation suite. Dropping from 100 creations to 25 was a big disappointment, and though the creations look much better this year in terms of graphical quality, the lack of choices and customization in a series that is known for its tremendous creation suite really hurts this game overall. I realize 2K had to start from the ground up on a new generation of systems and that the games will improve over the next few years, but this game is as stripped-down as it gets, compared to last year’s installment. Luckily the gameplay and graphics make it an enjoyable game regardless of its issues, but it isn’t worthy of Game of the Year from this gamer. It should be no surprise that Mario Kart 8 is my Game of the Year. 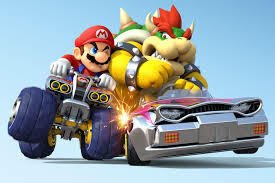 My second passion, after wrestling games, is racing games and the Mario Kart series has always been synonymous with quality. Mario Kart 8 is smooth, graphically-stunning and packed with content. The online is as fun as ever and sharing gameplay clips adds to the experience. The DLC program is one of the best I’ve seen in any videogame and is priced well-under what it is actually worth. The new glider and hovercraft gameplay additions take a racing series that was already a blast to the next level, and unlocking tracks, characters and vehicle customization options is easy, intuitive and fun. Mario Kart 8 is approachable by all ages and experience levels. It’s an extremely fun game to play with family members (we had a lot of fun playing at Thanksgiving) and has enough content to more than justify the price of admission. Honorable Mentions (in no particular order): Trials Fusion, Driveclub, Toad’s Treasure Tracker, Murdered: Soul Suspect, Sleeping Dogs: Definitive Edition, Grand Theft Auto V (Remastered), The Last of Us Remastered, Super Smash Bros. 3DS, EA Sports UFC, MLB 15 The Show, Plants vs. Zombies Garden Warfare and Costume Quest 2.